My stay in Singapore has exposed me to Thai cuisine. I noticed that pineapples are used quite extensively in Thai cooking. Since I had never cooked with this fruit before, I decided to give it a try. It is also important to find the pineapple type that does not irritate your throat. I bought some hard tofu from the store to complement the pineapple. I decided to add in regular spices that I use while cooking to balance the sweetness of the pineapple. The creamy texture of the dish made it a nice accompaniment for rice and we totally gobbled it up. Dry roast the coriander seeds and let it cool to room temperature. Meanwhile mix the maida with the yoghurt. Whisk and keep aside. Grind the roasted coriander seeds and half of the quantity of pineapple cubes and ginger into a fine paste. Heat oil in low flame and add the mustard seeds. When the mustard seeds crackle, add the cumin seeds, red chillies, curry leaves and fry them for a few seconds. Add the chopped onion and fry them till they are translucent. Now add the ground pineapple paste and keep stirring it continuously. Also add the turmeric, garam masala powder and salt at this stage. Add 1 cup of water and mix it well. Cover this with a lid and let it simmer for around 8 mins on low flame. Now add the pineapple and tofu cubes and allow them to cook for another 8 mins. Add coriander as garnish and serve it hot with rice or rotis. Lightly roast the coriander seeds. Do not let them burn. Cool well before grinding. Do not overcook the pineapple. You want it to have some texture. 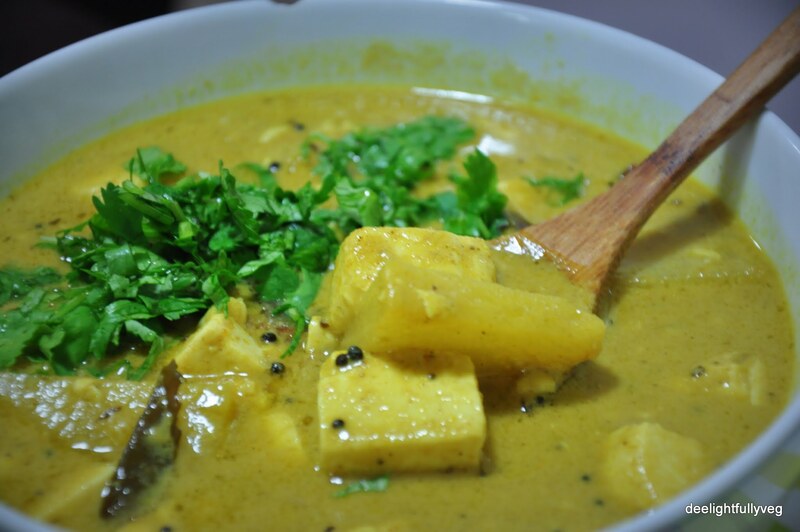 Posted on August 3, 2014 by deelightfullyveg	• This entry was posted in Recipes and tagged Gravy side dish, Pineapple, Tofu, Vegan, Vegetarian. Bookmark the permalink. I would love to try this unique combination. Thanks for sharing! I am so looking the flavours in this recipe! I love trying different curries. I don’t often cook with pineapple but I think this would be really tasty and summery too. Looks great. I had a similar dish at a Sri Lankan restaurant here in NYC. I love the combination of sweet and spicy. Thanks for sharing! pineapple in a curry… never heard of it. But I am sure intrigued by the sound of it. Good one! I nevr ate fresh pineapple in a curry before! That must be very nice!